After setting up the meta tent, we headed southwest towards Freeport to (hopefully) catch an evening whale watch (because the weather was supposed to be crappy in the morning). Along the way, we stopped at a few coves (no seals at the one we were told would have seals…sigh) and tromped down the path to the infamous balancing rock. Now G. & I have a debate going about this rock. From the photographs and copious descriptions, I thought it would be a bit more…ah…imposing? I mean, not that’s it’s not impressive, but as far as balancing things go, it doesn’t seem that incredible. But it was pretty neat, and I can’t complain because the tromp was nice and the view was pretty good. After the short hike, we sped down the island to catch a ferry (I can’t remember how far down the rock is) to Freeport (located on the island between the mainland and Brier Island). So Freeport Whale & Seabird Tours advertised in their brochure that whale watches ran in the morning, early afternoon, and evening (6 pm). We didn’t call ahead of time since the weather was good and, well, we should have. A sign next to the wharf said the last tour went out at 5. Shucks. 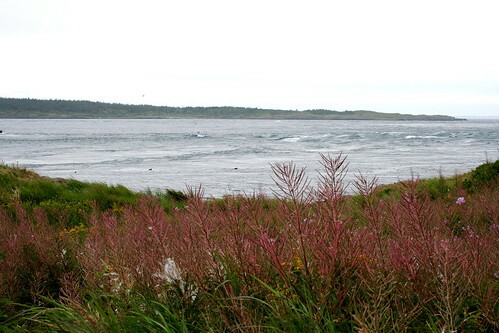 Seeing that the ferry to Brier Island was about to leave, we decided to jump on and explore the farthest out island we could drive to. 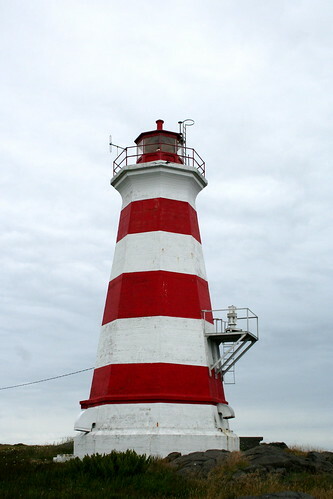 Once on the island, we drove down to the northern end, where a lighthouse was listed. The lighthouse was on a rocky island offshore (with approximately a billion seagulls flying around), but a path ran along the rocky, cold coast (by this time we had donned jackets and longsleeved shirts). 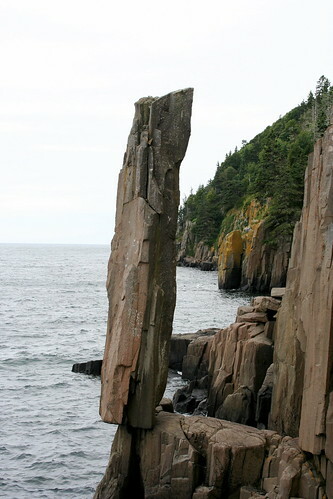 Because it’s the Bay of Fundy (with the largest tides in the world), the water obviously goes far up shore, so most of the rocks along the trail are exposed to the Bay. Seagulls must use the rocks to drop crabs and other shelled creatures on to kill and then eat because little crab legs and shells littered the area, and tidal pools dotted the shore. 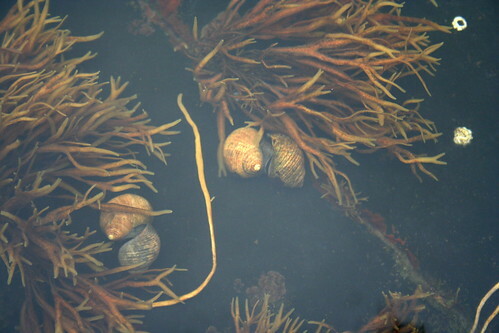 I’m a sucker for tidal pools, and although not much was crawling or swimming around in them, it was definitely fun to check a few out for life. Up on the soil, blackberry and blueberry bushes ran along the island. 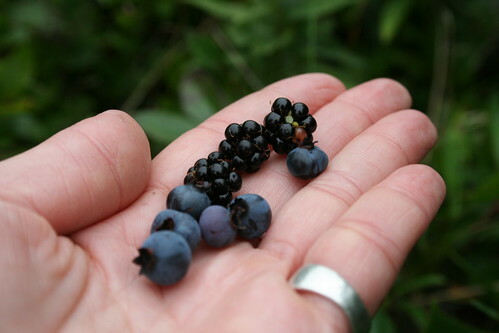 And a few had some ripe berries! There’s nothing, nothing in this world like foraged berries. 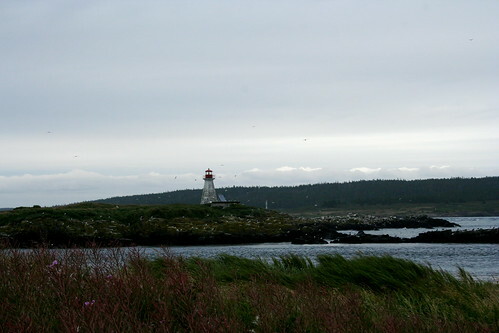 After we got chilly, we hopped back in the car and drove to the other end of the island to find the western lighthouse. Wikipedia just told me that there have been 57 recorded shipwrecks, which is a crazy amount, but, as we found out the next morning, is definitely not all that weird–the fog can get intense there. On the way to find dinner at the one restaurant (that we could find, at least) on the island, we hit the cuteness jackpot: a field with two of the friendliest sheep and two of the cutest llamas on the planet. Seriously, look at that baby llama. I would give the world for that llama. 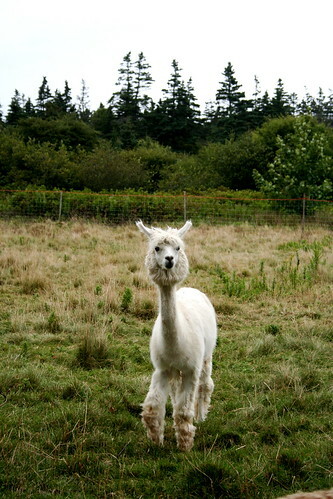 Or alpaca. Whichever it is. 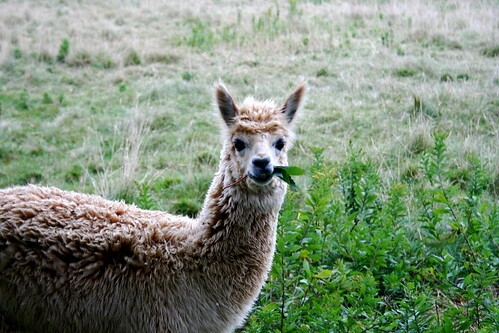 Ok, but the cutest, the cutest of them all, was the mamma llama/alpaca. I have no idea if it was the mamma, but I’m going to call it that because it’s even cuter that way. This poor llama had just been shaved, which makes sense, of course they get shaved since folks make wool products out of them, but holy crap, it’s a llama poodle! And it came right up to the fence! Too cute. So after the cute overload, we drove to the restaurant at the Brier Island Lodge. Again, nothing special cuisine-wise, but it was tasty and we had a nice view of the bay & sunset. We started with a liter (half liter? 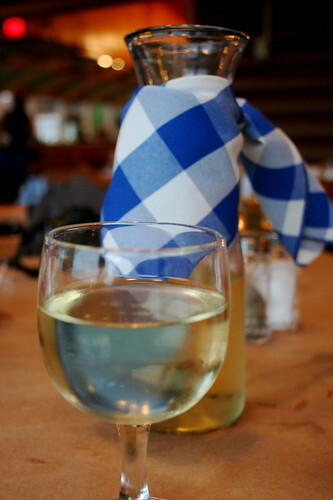 I have no idea) of L’Acadie Chardonnay, which the waitress described as dry but which I would describe as very fruity–a nice house white. 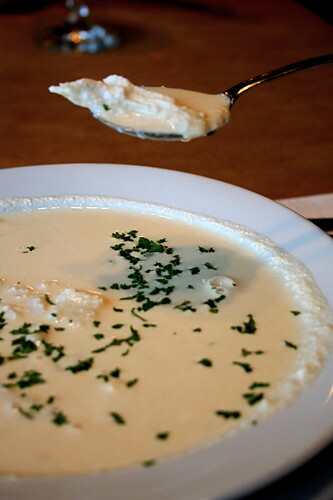 G. & I split a bowl of the fish chowder to start with, and it was good–definitely creamy and warm which is what I want in a chowder, but could have used more meat in it. And salt and pepper. Sad that we had to add that to it. 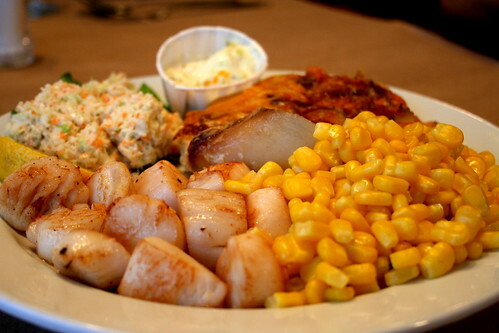 And for the main, we split pan seared scallops with scalloped sweet & regular potatoes, and corn. Scallops with scalloped potatoes! So meta! The scallops were good, but by this point we were getting scalloped out. The scalloped sweet potatoes were my favorite, but I’m a sucker for sweet potatoes any way (minus those with marshmallows–ick). Not a bad dinner. And afterwards we hiked in the dark to seal cove which, well, was a little too Blair Witch Projecty for me, but the wild rabbit that let me pet it was pretty darn cool. Then we drove back to the meta tent & hit the sack, ready to see some whales the next day! Did you get to watch the tides come in? I’ve heard it’s something to see. Sounds like you’re having fun. Thanks for the update! What a fun trip! 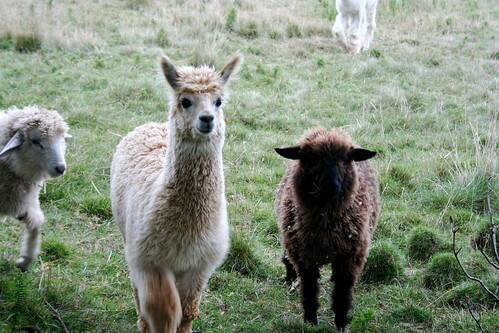 Those alpacas/llamas (I can’t tell what they are either) are too adorable! I probably would have tried to bring one home with me. I love the picture of you with the giant chess set from your previous post. Those llamas are THE BEST! Did you speak to the lady who owns them? She gives them fantastic names like Steve McQueen and Beyonce. I think that actually makes them even cuter!